Welcome to the University of Washington Physical Medicine & Rehabilitation Residency website. The University of Washington Physical Medicine & Rehabilitation training program is among the top residency programs in the United States, and the Department is consistently ranked in the top four by US News & World Report. A large patient population and multiple training sites to see Physical Medicine & Rehabilitation practiced in a variety of settings. Our Chairman, Dr. Peter Esselman, is a strong leader and is committed to resident education. Our program director, Dr. Karen Barr, has had a long career in medical education and is an enthusiastic and dedicated teacher. 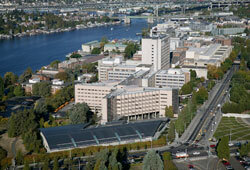 The University of Washington faculty includes some of the top physiatrists in the country. They are a diverse group with cutting edge expertise and provide excellent teaching and supervision to the next generation of physiatrists. The Department of Rehabilitation Medicine has a strong presence in the University of Washingon Medical Center (UWMC) and the Graduate Medical Education (GME) office. Some of the best and brightest residents in Physical Medicine & Rehabilitation. Our residents have diverse backgrounds from allopathic and osteopathic schools and some with prior training in other fields including Internal Medicine and Surgery. Applications for the Physical Medicine & Rehabilitation Residency are due by October 10th, 2017.